In this experiment I wanted to see where the turps-spray-into oils techniques and i might go together, in the spirit of Barb Bolt's co-responsibility in art praxis (http://www.acuads.com.au/conf2004/papers/bolt.pdf). I wanted to move beyond signifying cerepey skin. I wanted to move to deeper dermal layers, into flesh, as a metaphor for taking a deeper inward look. Yes, I wanted to suggest the ravages of gravity on aging flesh. But something more too. I wanted to say something about the emotions of aging. I applied impasto over the cheek with a painting knife, unlike the previous painting where I dropped wet into wet, using diluted pigment to begin with. Then, pheeest with my trusty spray bottle filled with clear odorless turps in a well-ventilated area (OHA&S). Unlike watercolour, where a spray of water has instant and far-reaching effect, with oils everything works in slow-motion. Even when spraying into an already turpsified area. I knew this already. But a couple of pumps into in the impasto seemed to have little effect other than make the paint soften. And I was looking for bigger impact. So I took the spray nozzle much closer to paint already swollen with solvent. The mechanical blast of the jet of turps rinse-carved out a path, revealing the viridian undercoat i had applied over the cheeks. The loosened paint oozed down the image in a very satisfying slow mud-slide. I felt a twinge of nausea as I saw flesh dissolve before my eyes. Yes, I coming to where I want to be. Next, attention to the mouth and chin. I didn't want this to slide off in the same way as the cheek (less is more) so I reverted to the technique I was now familiar with from the previous works - plenty of turps in a fine mist. And I mean plenty, so it that the clear turps is running down the surface, but gradually dragging some pigment with it. My task was to let it, to mop up the excess at the bottom, to judge when to spray some more and when to hold back. I was about to wipe the bottom of the chin clean for the third time when I saw that the blue vertical triangular run was actually quite satisfying as a composition with the curve of the cheek. And more to the point, in my quest for expressive mark-making, it was emotionally loaded as an image. It seemed to me to suggest both melting flesh and running drool from an inconsolably wailing face. It signified walking decay in flesh ravaged by gravity among the baby-boomers, and grief at the loss of youth. And a Lear-like howling in the storm. And so I painted in the storm clouds over-head, darkness closing in, pressing down. The glasses I wanted plain bright white. Partially for compositional reasons. Contrast. Tonal highlight. Focal point. But mostly, as in the previous works, to intimate a blankness of psyche. We look into the eyes of another to read their level of understanding and their degree of empathy. Eyes are the barometer of the soul. More commonly understood, the eyes are the windows of the soul, and I wanted these windows frosted over. Yes, like the eyes on the dead go milky white. But mostly I wanted these lenses blank like the mind of those in the grip of a panic attack go blank. With a hint of the panic being private, hidden behind white sunglasses. As in the song-line, "mmm, sunglasses to hide behind, mmm, sunglasses to cry behind" http://www.mp3lyrics.org/t/tracey-ullman/sunglasses/. The emptiness of eye-space foreshadows the departure of the soul, when the windows will indeed be become blank, the house un-inhabited. Intimations of mortality. These glasses signify private blind terror, private grief at departing. self-portraiture - the art of self-disclosure. Wonderful work Harry. So evocative of true angst, that long silent scream that goes on into infinty. That anguished moment that lasts forever. You portray it better than it could ever be written. Thanks for looking back at some of the earlier posts, Steppenwolf. Yes, for some the scream is not simply an event that hangs in the air for a finite time, fading, but a state of being that feels like it is simply a part of the fabric of daily reality. 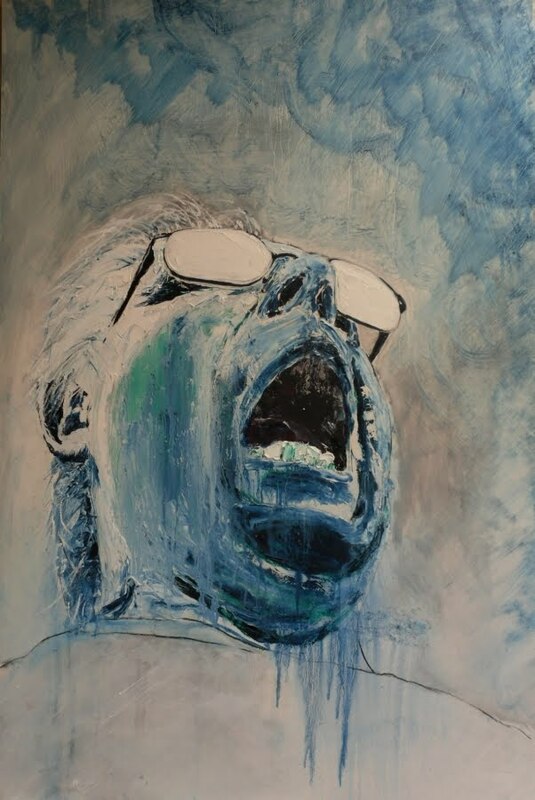 Thank you Gary Everest for the confidence you have expressed in my art and the superlatives you lavished on this post on Blue Rain in your own blog at http://gleverestpaintings.blogspot.com/2010/09/blue-rain-self-portrait-in-blue-by.html. You paint such immaculate portraits, at a skill level I will never attain, that I am quite humbled by your comments. I really love your work, you have an amazing force, expressiveness and confidence on it. I hope some day I can see it in person, because I imagine that texture must be impressive live.